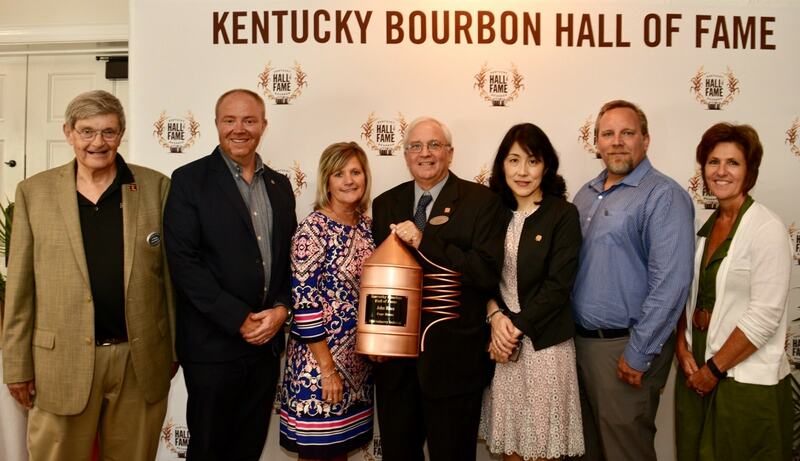 Last week, the prestigious Kentucky Bourbon Hall of Fame honored five individuals for their service and support of the Commonwealth’s signature industry, including former Four Roses Distillery Chief Operating Officer, John Rhea. Created by the Kentucky Distillers’ Association (KDA) in conjunction with the Kentucky Bourbon Festival in 2001, the Kentucky Bourbon Hall of Fame recognizes individuals and organizations that have made a significant and transformational impact on Bourbon’s stature, growth and awareness. It is the highest honor given in the industry and is presented annually during the Kentucky Bourbon Festival. The induction ceremony was held on the grounds of My Old Kentucky Home in Bardstown, one of the state’s most revered historic sites. KDA President Gregory presented John Rhea with an engraved miniature copper still before a crowd of 150 Bourbon barons and dignitaries. John’s name was also added to a Hall of Fame display at the Oscar Getz Museum of Whiskey History in Bardstown. A 40-year veteran of Four Roses Distillery, John Rhea has been a key leader in elevating Kentucky’s signature Bourbon and distilled spirits industry to unprecedented heights, and has played a vital role in the historic resurgence of Four Roses. Rhea, a native of Bullitt County, began his career at Four Roses as a Maintenance Supervisor after graduating from the University of Kentucky with a Bachelor of Science degree in Mechanical Engineering. His wealth of experience in building and operating distilleries around the world led to his eventual position as Chief Operating Officer, where his tireless efforts have transformed Four Roses back to its rightful place as one of the world’s most premium and sought-after whiskies. With the majority of his work performed behind-the-scenes, Rhea’s quiet leadership has been instrumental in transforming the industry through the KDA as Director, Treasurer, Vice-Chairman and Chairman over the last two decades. He never sought the spotlight as he constantly advocated and educated consumers, tourists and elected officials at all levels of government about the growing and significant impact of all Kentucky Bourbon distilleries.